Last year, the SCO launched their season with a blockbuster performance of Don Giovanni. This year's programme, though on the face of it comfortably pitching familiar names and familiar repertoire, managed nevertheless to introduce an element of risk. First of all, and perhaps the least foreseeable, this is the third Symphonie Fantastique in Edinburgh within the last year. True, the RSNO's was almost a calendar year ago, and the Philadelphia's a different scale and approach entirely. Then again, while Berlioz's and Schumann's names are familiar, the first-half works are rather less familiar. That raises an interesting issue, which concerns the extent to which the young maestro has established a relationship of trust with his audience. Another matter is a simple question of duration. Among the calculations potential audience-members might make, the thirty minutes' combined duration of the two first-half works (about which the season brochure is candid) could be considered short measure. It feels a bit odd to be able to go shopping afterwards, and still be home before 10pm. As it turns out, Schumann's Genoveva overture is a somewhat pallid work. Drawing on the romantic lexicon, there are plenty of diminished chords—he even opens with one—and horn calls, but the material is not tremendously strong. Nevertheless, Ticciati’s shaping and balancing brought out some lustrous textures and snatches of radiant warmth. For Tristia, the ensemble was joined by the SCO Chorus. This, too, is an odd affair. The three parts were seemingly composed separately but published together. Although the third number bears a title that links it to Shakespeare's Hamlet, it is wordless, so the connection to the prior number—The Death of Ophelia, based on Ernest Legouvé's paraphrase—is vague, while the first number, Religious meditation, is based on a poem of Berlioz's contemporary Thomas Moore. One could describe the first two as a wash of loveliness, exceedingly pleasant to experience, and with occasional touches of colouration to relish such as the passage of crunchy bassoon chords in the second, but beyond that little of note to latch on to. The third, however, is a completely different matter: austere and poignant, but also theatrical in its gestures—much richer in its orchestration—so that it seizes one's attention and doesn't let it go. Maybe it goes without saying, but let's say it anyway: the SCO Chorus were in excellent form, seamlessly and effectively blended with the orchestra, whose relatively modest forces proved again to be balancing textures and timbres with refreshing clarity. 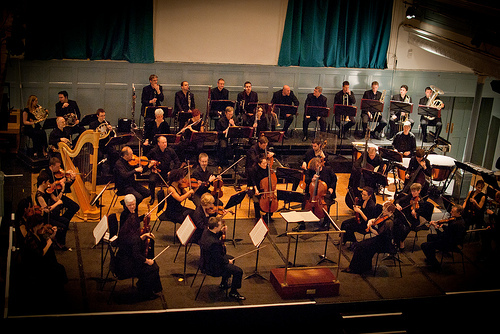 Those forces, and that dynamic, contributed to what turned out to be a memorable reading of the Symphonie Fantastique. Where the Philadelphia in the summer had two of those large, pivot-mounted bass drums turned horizontal, one of the SCO's bass drums was about the size of a drumkit's pedal bass—and a similar scaling back could be found throughout the ensemble. Less obviously visible, the natural trumpets' narrow bore reduces their effective dynamic range but, fascinatingly, in passages of the first movement, what Berlioz gets from them is a timbre that is starting to resemble a cymbal roll. With the improved clarity of texture comes an improved lucidity in Ticciati's hands. Where the first two movements often come over as meandering and unfocused, he held them taut, and fused them to an arc that threaded the work together with a uniformity of purpose that, for all the splendours of the concluding movements, is not always apparent.